Does your motor vehicle registration expire in early August 2018? If so, plan ahead and renew early to avoid being impacted by office closures. All Colorado title and registration services, including motor vehicle registration renewal, vehicle titling, International Registration Plan (IRP) and ownership transfers will be unavailable in-person August 1-3, 2018, to allow for data conversion and software updates by the State of Colorado. The statewide Motor Vehicle and Driver License Office closures will allow the State of Colorado to replace the Colorado State Titling and Registration System (CSTARS), originally installed in the 1980s, with a new system, Colorado DRIVES, allowing for better county-to-county integration, faster transaction processing and additional online services. We apologize for the inconvenience this closure may cause and look forward to providing the residents of Mesa County with efficient, user-friendly services. 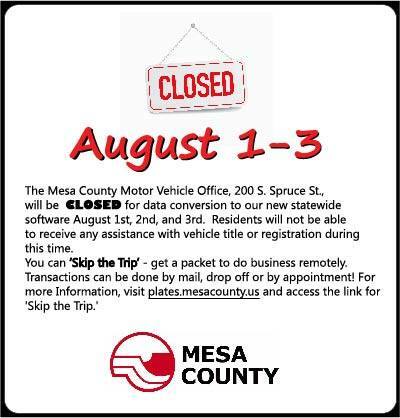 Though there will be no in-person services during that time, you may still complete several services utilizing "Skip the Trip," which may be found at plates.mesacounty.us.